​ they will resume October 2019 and will be offered around every 4-6 weeks. My workshops are designed to give you a strong foundation in both handling encaustic paint, and fusing, as encaustic painting is a two step process. 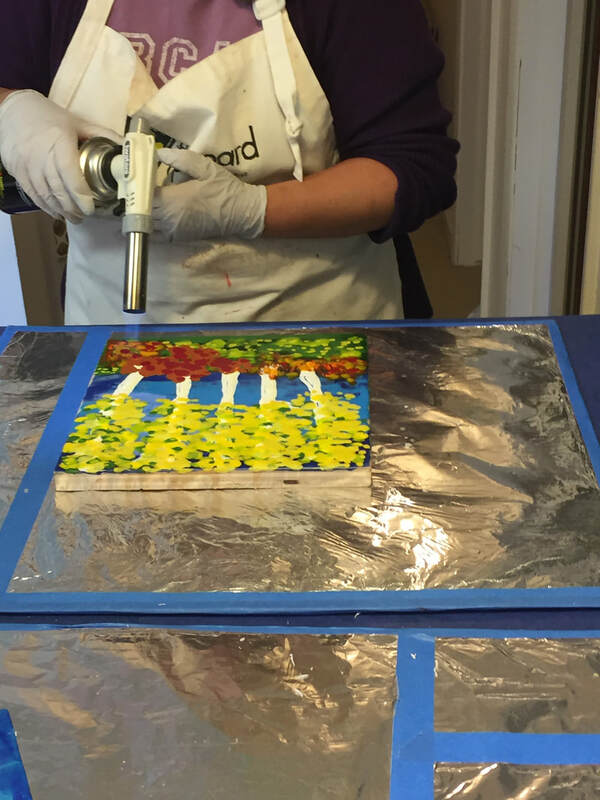 You are encouraged to use a limited number of colors and follow your creative voice while you learn to paint in encaustic. I believe in encouraging exploration as you learn to work with the materials, rather than instructing in painting a specific subject. Encaustic painting is challenging and exciting, being able to embrace the unexpected is important when learning to paint with molten wax. 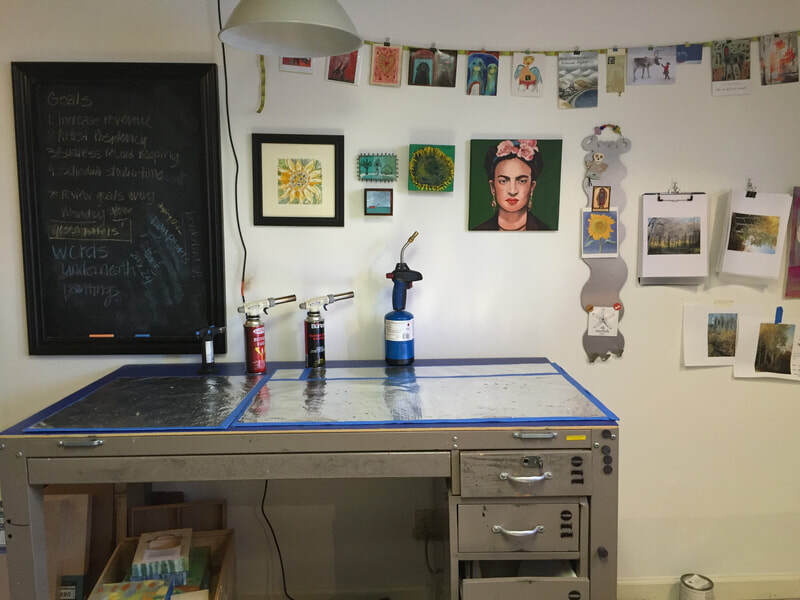 You can book a Custom Workshop for 3-4 people, this is available year round. There are a wonderful way to spend a creative, challenging day with a small group of friends or family. These workshops are for adults and older teens. (15+). Find a group of 3 or 4 participants. Contact me with possible dates. Once we find a date that works, I put you on my calendar for a workshop. You'll pay for one spot to hold the date, the other spots can be paid for in advance, or the day of the class. $135 per person, 3 minimum, up to 4 participants. Email for more info or to schedule. If you have taken a workshop with me and want some more time refreshing techniques and brushing up getting comfortable handling encaustic paint-this is the perfect option for you. 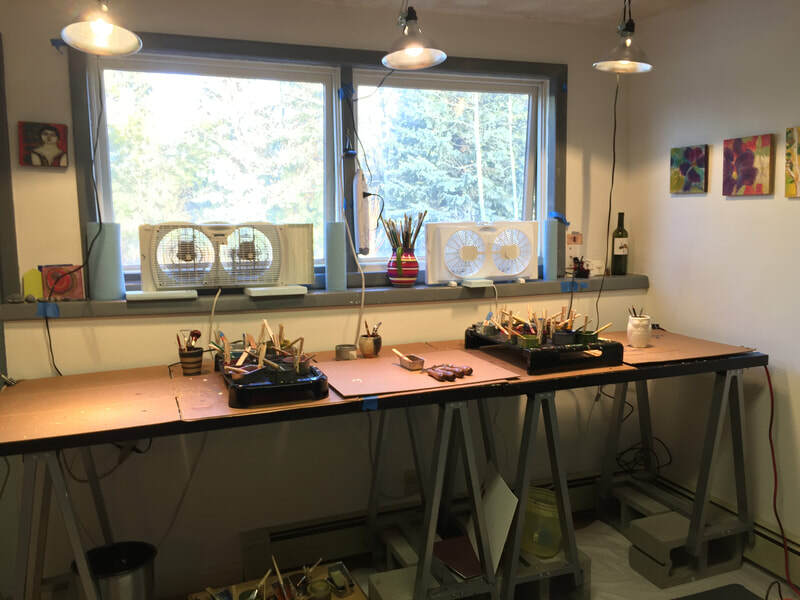 We'll spend 2-3 hours in the studio, review and refine painting and fusing techniques, answer questions and get you confident to try encaustic painting on your own. If you have a heat gun, torch or other supplies you want to try with a little help-this is a great way to get more familiar with them and compare how they work for you. $50/hr includes supplies. This can usually be booked on fairly short notice. Contact me to schedule. Sign up for my newsletter to get information in your inbox about upcoming workshops and events. Don't worry, I only have time to send out 4 or 5 a year, so you won't be buried in emails from me! "I feel equipped to try this on my own. Excellent job explaining medium, technique, creative ideas and resources. So excited to go home and try this on my own! You gave enough important info and plenty of time to use the skills we learned-so encouraging!" "I love Darla's work, but she really EXCELS at teaching too. Very thorough instruction. Very good about explaining and then allowing students to explore." "Thanks again...I learned so much! It was a great class - plenty of time to learn and play! 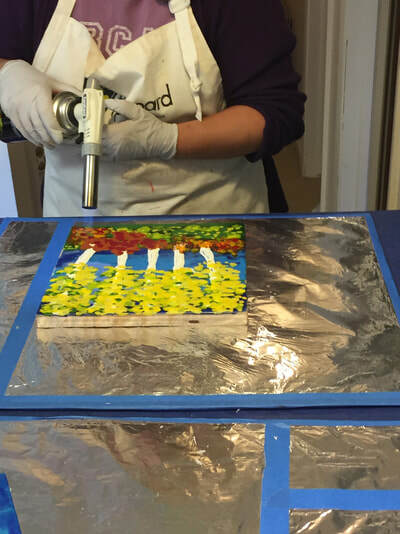 I hope to continue learning encaustic! And I will definitely tell others about your workshops! Thank you!" 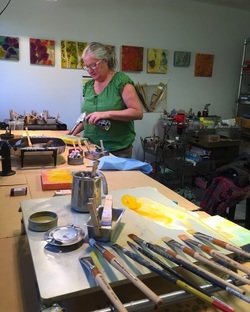 "While I do not consider myself an artist, I found encouragement from Darla and discovered that Encaustic is a forgiving medium. The art is almost more about discovering what is inside rather than producing exactly what you imagined. I am curious to learn more, and grateful for Darla's experience and heart to teach!" who's looking for a fun, challenging and creative opportunity to explore this medium."